We have a lot of feral cats around here. One in particular, whom I had named “Old Yellow”, took up residence at my home. Old Yellow has been missing for about a month now. I had grown accustomed to him and he had gotten used to me. He still didn’t trust me enough to let me pet him. But, he would come up and curl around pants legs as cats are prone to doing. But, this post is not about him…although I wish it were. I have a wooden fence around my back yard. It’s about six feet high. It has 2 inch gap between each plank. Most cats have no trouble jumping it from a complete standstill. I’ve seen them do it. Old Yellow couldn’t because he had gotten too big. It is normal to hear cats screaming at all hours of the night. Nature will not be deterred. I just figure it’s another female in heat. Tuesday morning, about 2AM, I heard the cat screams again. But, these weren’t normal cat mating screams. This was almost like a woman screaming. Ralph, my beagle, was obviously upset and started barking. So, putting on my pants, grabbing my pepper spray (just in case), I went and opened to back door to see what was causing the screaming. 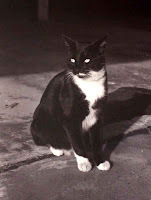 At the far southwest corner of my fence, I saw a black and white cat at the very top of my fence. Ralph wanted to get out and go investigate also. Thinking that would not be a good idea, I kept him inside. This cat was now screaming for all he was worth. It even woke up my next door neighbor (which I was hoping would not happen since I can’t stand him). As we both walked toward the cat, the cat was now in hyper mode and was hissing and swinging its one free front paw at us. The cat, as I had figured, had his right front paw wedged in between two wooden planks of my fence. The problem; how to get him out. I tried to push him and nearly caught a good whack from his claws. This cat was still screaming during this entire time. My neighbor got a board from his yard and tried to push him upwards in an attempt to free the cat. He just screamed that much more. I remembered what Steve Irwin, The Crocodile Hunter, would do with an animal he was trying to snare; he would throw a blanket over the animal so it would calm down. I told my neighbor about this and he went into his house and brought out a big beach towel. The cat saw this, and for some reason, started going berserk! He was jumping and dancing on top of that fence. But, he still couldn’t free himself. Neighbor threw towel over the cat and he immediately calmed down. As soon as he had that blanket over him, I grabbed his wedged paw and freed him. Now, all we had to do was take the towel off the cat and let him go. But, this cat was still mad as hell. He was growling like crazy. I looked at the neighbor as if to say, “It’s your towel.” But, it’s my fence. So, hero that I am, I flung the towel off the cat, the cat then leaps completely over my head and runs as fast as he can on three legs. I hope his leg wasn’t broken. I didn’t go back to sleep all night. I didn’t wake up until about 9AM yesterday morning. So, as I went to go eat breakfast, I saw the same black and white cat sitting on top of my garbage can. He wasn’t threatening. In fact, he was quite sedate. It was almost as if he was thankful for what I had done last night. After seeing me and staring at me for a few seconds, the cat took off. I haven’t seen him since yesterday morning. Hopefully, he'll stay away from fences from now on.